Get in touch with our team at SyntecOptics.com for your queries related to high magnification imaging components for zoom applications in biomedical imaging. 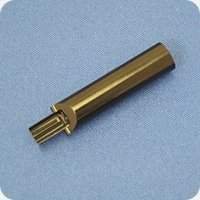 With a long history of providing top quality and delivery of intricate parts, precision optical engineering team of Wordingham Technologies was contacted by a client to make a high magnification imaging component. This part has a 2 start internal thread feature with a width of .189 and a pitch of 2.0 inches for a zoom application. Because of the thread pitch and close tolerance on the .189 width, this feature was challenging to produce.